The first Registered Nurse Degree Apprentices in England have begun their studies at Northumbria University, Newcastle. 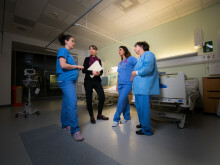 Northumbria University shortlisted for four top nursing awards. Hospital staff are set to benefit from a new study that aims to help them manage the tiredness and fatigue they experience when working night shifts. Recent media reports about the use and exploitation of personal data have increased public awareness of the benefits and drawbacks of sharing information online. A new, faster and safer way of diagnosing the Ebola virus has been developed by an academic from Northumbria University, Newcastle. Research led and carried out by Dr Sterghios Moschos at Northumbria means that patients with Ebola-like symptoms can be identified and treated much sooner and at the point of care, helping to reduce the spread of the disease and risks to others.